Jeffrey Welch's Blog: Are Those Dog Farts Normal … Or Something to See the Vet About? The post Are Those Dog Farts Normal … Or Something to See the Vet About? by Sassafras Lowrey appeared first on Dogster. Copying over entire articles infringes on copyright laws. You may not be aware of it, but all of these articles were assigned, contracted and paid for, so they aren’t considered public domain. However, we appreciate that you like the article and would love it if you continued sharing just the first paragraph of an article, then linking out to the rest of the piece on Dogster.com. Farts are caused by gasses in the digestive system and are released through the body. While stinky and maybe a little socially awkward, passing gas or “farts” are a very normal part of life for people. But, what about our dogs? Are dog farts normal — or ever something to worry about? How Many Dog Farts Are Normal? How many dog farts are normal? Photography ©CarlyDybka | Thinkstock. If you’ve been around dogs for any length of time you’ve probably heard or at least smelled some dog farts. Some amount of dog farts is normal for most dogs. However, excessive farting or a change in the amount of dog farts may signal food allergies or other kind of gastrointestinal (GI) upset in dogs. If your dog’s farts seem to be changing or increasing, it’s a good idea to consult with your veterinarian to see if something underlying is going on or if your dog is just gassy. What Types of Dog Farts Are There? Embrace Pet Insurance Claims Manager Rachel Hinder explains that the different kinds of farts dogs experience are similar to our own. “Silent but deadly,” noisy, stinky, etc. are all common kinds of dog farts. The type of fart is usually not an indication that your dog has GI upset or is simply gassy. While some amount of dog farts is normal, farting can be a symptom of an underlying digestive issue going on for your dog. Changing a dog’s food to a new diet is a common cause of gastrointestinal upset in dogs. This is especially true if you don’t slowly change the foods. Before changing your dog’s diet, contact your veterinarian to discuss the best food for your dog, and the appropriate way to make that change. Dog farts can also be linked to dogs ingesting high-fat snacks, especially people food. Table scraps are commonly associated with an increase in GI upsets for dogs, and dog farts might be a symptom of that. Although some people foods in moderation are acceptable snacks for dogs, fatty foods and large amounts of human foods aren’t a good idea. Similar to burping, dog farts might be related to eating too quickly. If you notice your dog is overly excited to eat food, and then is passing a lot of gas, you might try to feed smaller meals more regularly, use your dog’s meal for training, and/or utilize a slow feeder to encourage your dog to eat more slowly. Do Some Dogs Fart More Than Others? All dogs fart, and there isn’t a lot of attention paid to farting when it comes to veterinary research into different dog breeds. However, anecdotally, people will tell you that some breeds definitely fart more than others. 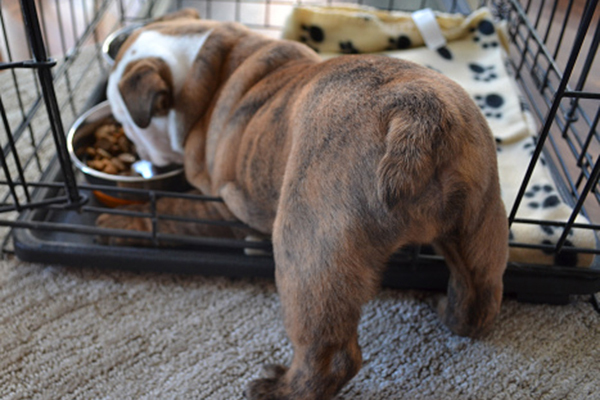 In particular, Bulldogs (English Bulldogs and French Bulldogs) are known for their farts. In addition, the bigger the dog, the bigger the farts. My Newfoundland doesn’t fart regularly but when she does it’s what I like to call “people sized” in terms of sound and smell. Her farts are much more noticeable than my 50-pound Cattle Dog mix or 10-pound Chihuahua mix. When Are Dog Farts a Reason to See the Vet? It’s possible that your dog’s food is making her fart. While the occasional fart from your dog isn’t something to be concerned about, excessive farting can be a symptom that something more serious is going on. If your dog starts farting a lot and exhibiting other symptoms of gastrointestinal upset, such as loss of appetite, vomiting, diarrhea, or a distended or uncomfortable abdomen, it’s important to make an appointment with your vet to see if those dog farts are part of something larger going on with your dog’s health. Thumbnail: Photography ©WilleeCole | Thinkstock.